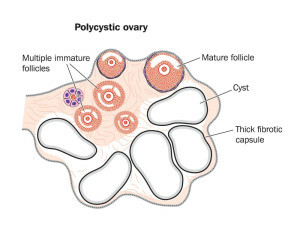 Ovarian cysts are common due to the fact that a woman in the reproductive phase of her life goes through cyclical hormone changes where in the first 2 weeks of the menstrual cycle a follicle (=a mini-cyst) develops. This ruptures midway between two periods during ovulation when the egg is released. In the second half of the hormone cycle (in the 2 weeks before the menstrual period) progesterone type hormones are produced in the former cyst where the egg had matured (corpus luteum). Variations of this normal situation lead to ovarian cysts or persistent follicles, which are quite common. With persistent follicles (where no ovulation has taken place) there is a lack of progesterone production as the corpus luteum has not developed. 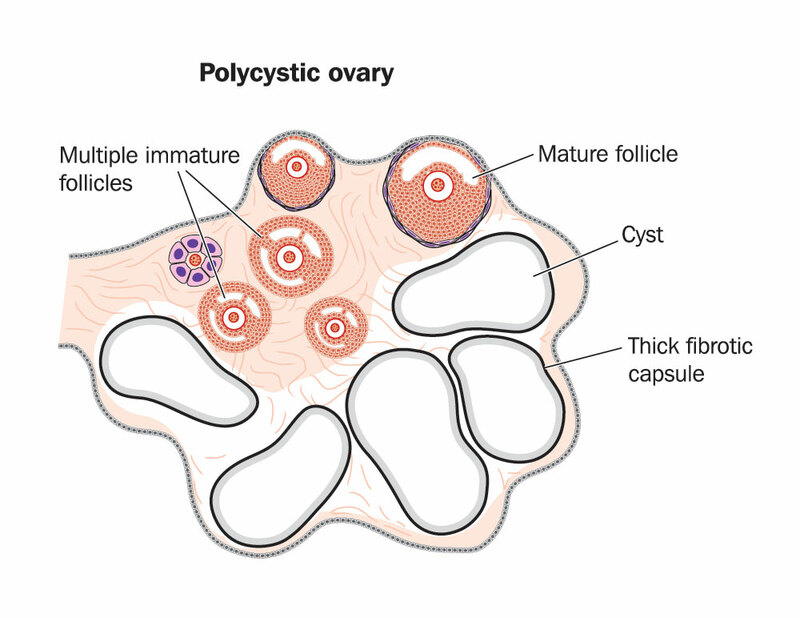 Polycystic ovary syndrome is associated with a more profound change of the entire metabolism. There is now evidence that polycystic ovary syndrome (thanks to healthfully.org for this image) is often associated with the syndrome of insulin resistance or metabolic syndrome (Ref.1). About 7% of women in the reproductive age have this syndrome. There is a subtle change in the ratio of LH/FSH hormone. These patients have a changed metabolism with insulin and testosterone overproduction. They are usually also overweight and the body appearance is different. They have smaller breasts, a male pattern hair distribution (hirsutism) and are missing their periods or are completely anovulatory and infertile. One of the symptoms is ovarian fullness due to a multitude of cysts, which come from the luteinizing hormone (LH) overproduction. These cysts can rupture and produce a clinical picture similar to a single ruptured ovarian cyst. However, the other physical findings would help with the diagnosis. Also, blood tests would help the physician, where a lipid profile, testosterone level and an increased LH/FSH ratio would confirm the diagnosis of polycystic ovaries. In the case of polycystic ovary syndrome a comprehensive treatment protocol is required. A referral to an endocrinologist would be desirable. The endocrinologist will likely suggest some weight loss to help the syndrome of insulin resistance. This has recently also been treated successfully with Metformin, an oral hypoglycemic agent. Progesterone and Spironolactone are also used for this condition. There is a big difference between single ovarian cysts or polycystic ovary syndrome. The former is usually a follicle that persisted, in other words it did not burst at the time of ovulation. It can produce hormones and lead to irregular periods. It also can rupture and discharge some blood into the abdominal cavity. This would cause abdominal pain, which would come on suddenly. It is located in the right or left lower abdomen depending from which ovary the symptoms arose. As there is pelvic irritation all of the symptoms described for PID or for appendicitis could be there (pain followed by vomiting). A single ovarian cyst often can be treated conservatively. However, the treating physician must rule out any other more serious cause of abdominal pain such as appendicitis or an ovarian tumor. Often a diagnostic laparoscopy has to be done by a surgeon or gynecologist. Dr. John Lee (Ref. 10) notes that women who develop ovarian cysts often benefit from progesterone treatment. It is best to give 15 to 20 mg natural progesterone as a cream once per day on day 5 to 26 of her cycle. It usually takes 2 to 3 cycles for the cysts to disappear. Blood tests of FSH and LH will normalize and estrogen production will go down and be balanced by the progesterone. When saliva tests are done (which is the most trustworthy test for progesterone and estrogen tissue levels) the progesterone/estradiol ratio (P/E2 ratio) needs to be above 200. The woman shown above has used bioidentical progesterone cream to treat her polycystic ovary syndrome, which was due to estrogen dominance. Using progesterone cream she overcame her infertility problem. 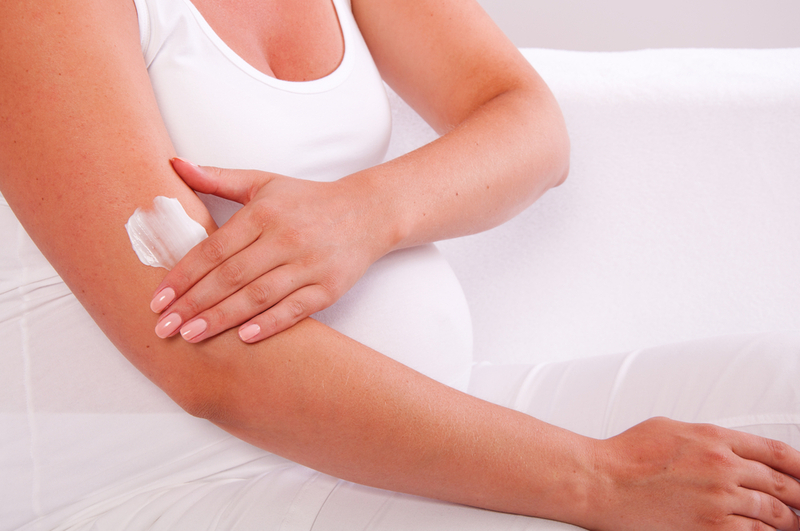 Now that she is pregnant, her specialist recommended to continue the use of the bioidentical progesterone cream as she has a history of premature labor with her previous pregnancies. Dr. Lee and other anti-aging medicine authors have pointed out that placental deficiency of progesterone production towards the end of a pregnancy can cause premature labor. 10. Dr. John R. Lee: Natural Progesterone- The remarkable roles of a remarkable hormone”, Jon Carpenter Publishing, 2nd edition, 1999, Bristol, England.